For ages 8 and up, this fun activity is perfect for community groups, workplace team-building or family functions. 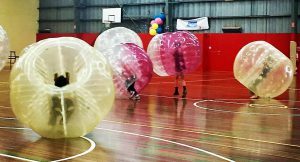 We can either run the activities on the basketball courts at HILAC, or at a venue of your choosing (pending approval from us to make sure it is ok for the bubbles). 2 hour booking at HILAC – $330.50 (external bookings may have additional costs due to staff travel). All bookings come with a HILAC staff member to run the activities.